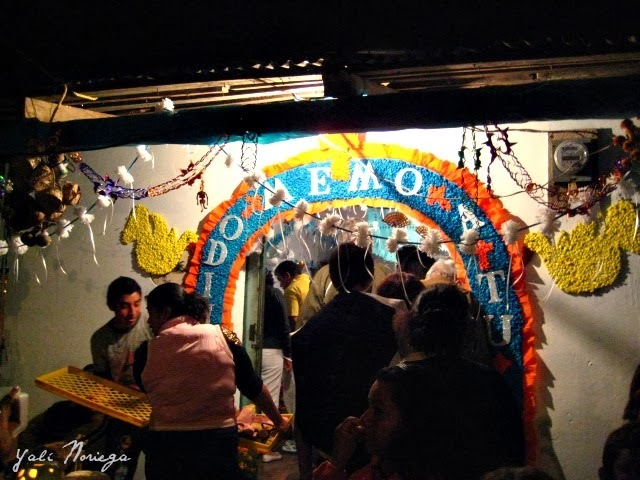 La noche del 1° de noviembre fui con mi mamá a Ocotepec, un pueblito aquí cerca donde la gente abre sus casas para que cualquiera visite las ofrendas. Uno puede llevar flores o velas, pero es normal entrar, visitar, tomar fotos y pasar a la siguiente casa. 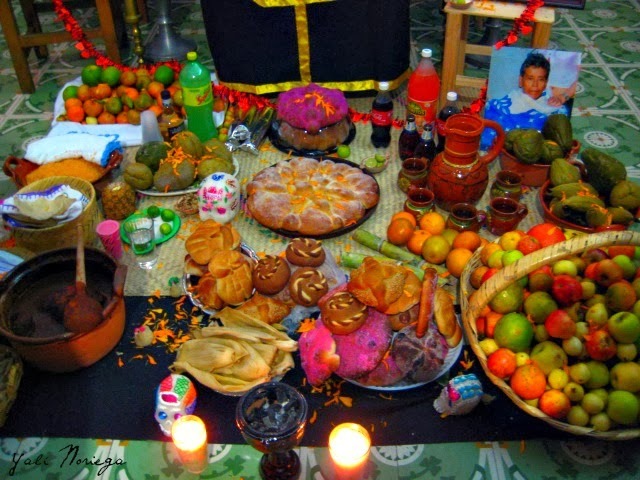 Las ofrendas son enormes e incluyen todos los elementos tradicionales además de, en un nivel más alto, una representación del ataúd con la ropa y zapatos del muertito. En el atrio de la iglesia había una estudiantina alegrando aún más la noche. Éste un festejo de la vida y la muerte, pues no son más que dos caras de la misma moneda. No hay que temerle a la muerte, sólo es la siguiente etapa. ¿Por qué no llevar flores y música? 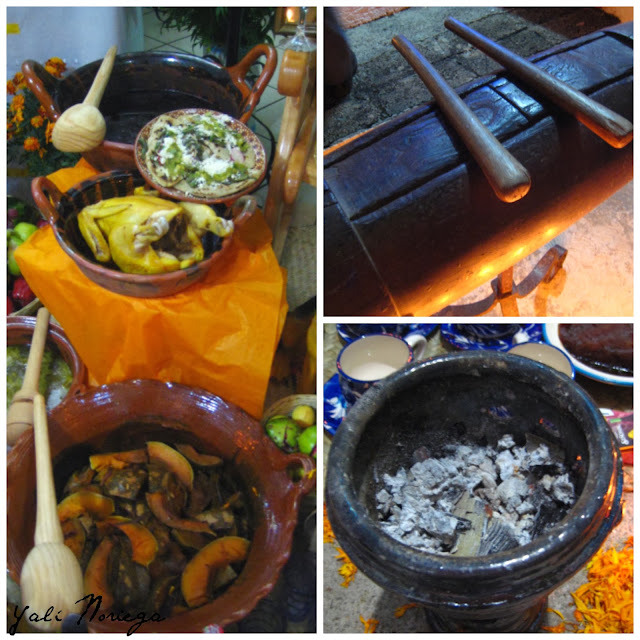 Otra parte de la tradición que me parece increíble es que a la salida de las casas, los dueños te ofrecen comida. 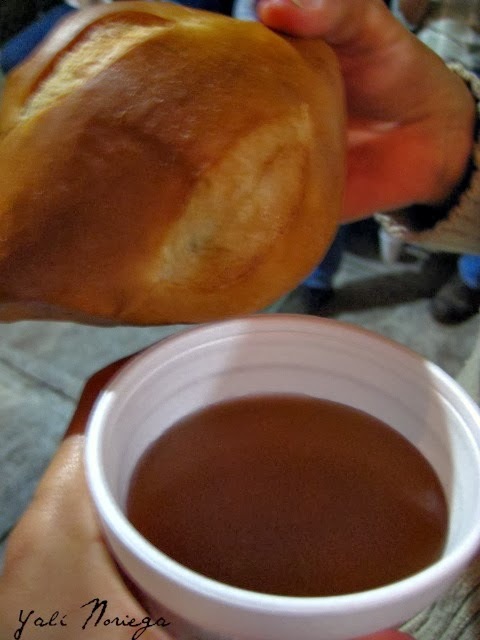 Puede ser un pan o pueden ser tacos, además de ponche, aguas frescas o café (según qué tanto frío haga). No importa qué tan pobre sea la familia, siempre habrá algo para alimentar a vivos y muertos. En un país como éste, es un gran gesto. Me demuestra que en el fondo somos un pueblo generoso, trabajador, dedicado. 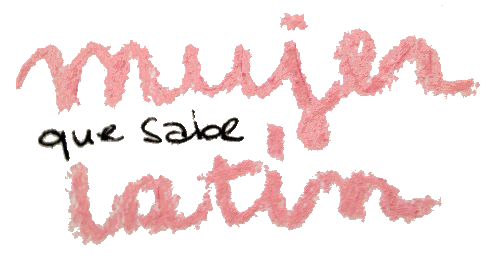 Y si no podemos crear comunidad en un día tan especial, ¿entonces cuándo? 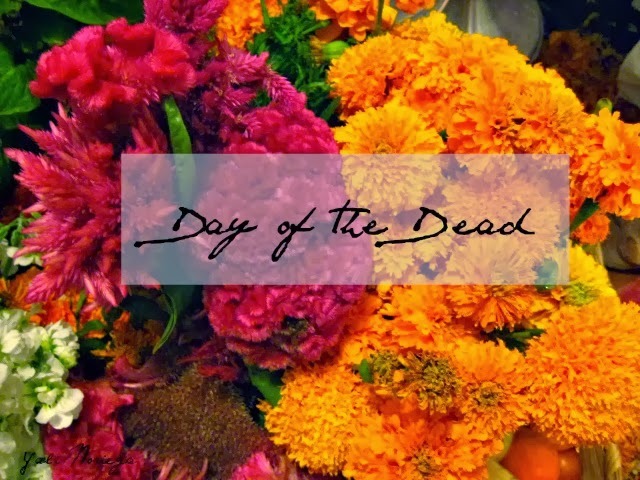 ¿Cómo pasaron el Día de Muertos? I love visiting small towns on the nights between October 31st and November 2nd. People open their houses and everyone can come in to see their offerings. Visitors might bring flowers or candles, but generally it's fine to just walk in, look around, pay your respects to the family, and move on to the next house. The offerings are a big affair. 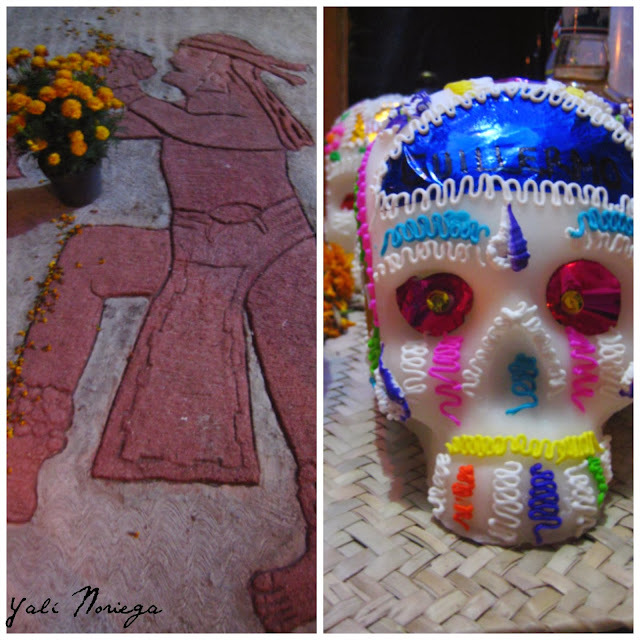 They include all traditional elements: candles, flowers, incense, food and drink, images, sugar skulls, salt, bread, water, colored paper, and often also, on a higher level, a representation of a coffin upon which are laid out the clothes and shoes of whoever they're dedicating the offering to. 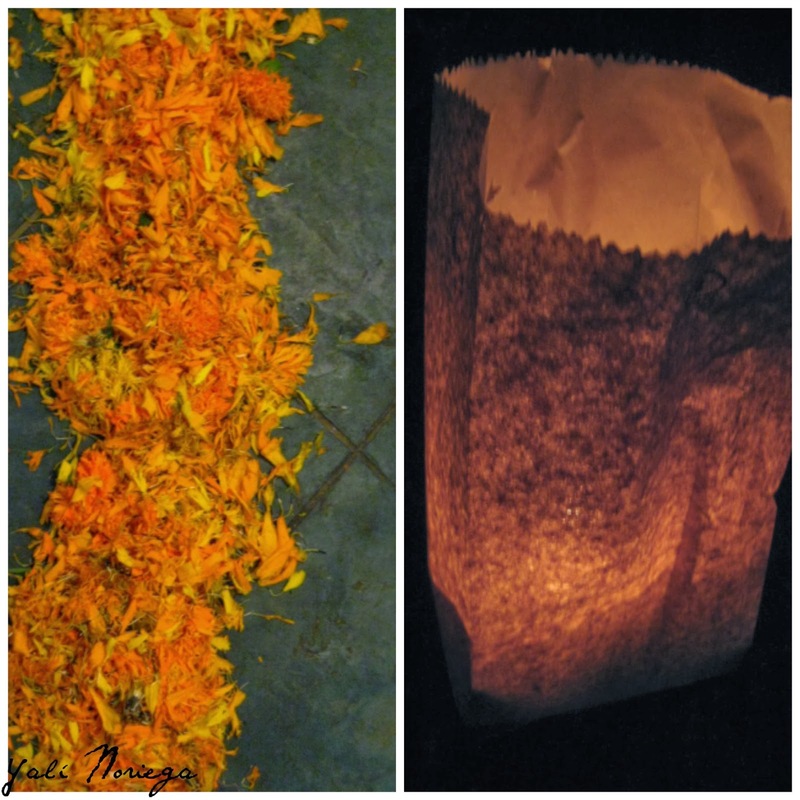 The candles attract the spirits, there's a path of marigold petals to make sure they arrive to the house, there's water for refreshment, food and drink for them to remember their days upon this earth, salt so the soul avoids corruption, and personal objects. There was a small traditional band singing outside the church, bringing even more happiness to what is already a joyful holiday. It's basically a celebration of life and death, seen as part of the same cycle. Culturally we don't think death is something to be afraid of, it's just the next stage to be lived, so to speak. So why not celebrate it? Another part of the tradition that is very moving, at least to me, is that once you have visited an offering, the owners of the house give you food. It can be a simple bread or some tacos, and there's coffee and punch. It doesn't matter how poor the family is, they will always feed both the dead and the living who come to their house. Let me tell you that in a country such as this, where almost half of the population lives in poverty, that is no mean gesture. It showed me that we really are generous, hard working, dedicated. And if we can't create a sense of community and solidarity on such a special day, when can we?